Looks like the NYT discovered and wants everyone to know that "the cloud" and all the internet that binds our world together is not floating around us, but is under us and the great blue sea. The article is behind the paywall, so I won't make you go there, but let's touch on the topic. Oceanic cables might seem like a 19th Century wonder, and they are, but that was just the first time our world was stitched together. At war, it is not a new thing to consider data part of commerce and a nation's C2 infrastructure. Ever more so, the Information Age or Cognitive Age or whatever you want to call where we are now, it is all driven by fiber optic cables. Along those cables run everything from free pr0n to, as we discussed on Midrats yesterday, the command signals to our drones we use to fight our foreverwar. That is just entertainment in a 3rd rate nation. Now consider what would happen to a global mercantile power engaged in military action. Not just a "soft kill" that has to do with electricity and software ... but a hard kill? The crew of each steam-cutter consisted of a cockswain, two seamen, a fireman, and a coal-passer. In addition to the crew, a sergeant of marines and half a dozen privates were to go as sharp-shooters. They were to be armed with rifles. In the Marblehead's steam-cutter a one-pounder Hotchkiss cannon was to be mounted on the forecastle. 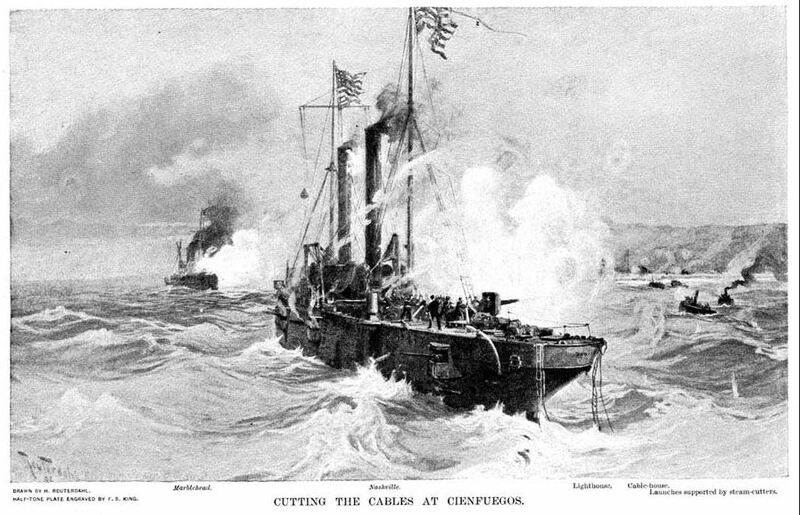 The Nashville's steam-cutter was to have two Colt machine-guns, one forward and the other aft. All boats were to be supplied with life-preservers. The tools for cutting the cables, to be carried in each sailing launch, consisted of cold-chisels, blacksmiths' hammers, a heavy maul, a block of hard wood with iron plate for its upper surface, an ax, wire-cutting pliers, and a hacksaw. Coils of stout rope and grapnels of different sizes were to be used in grappling the cables and bringing them to the surface. My own individual orders were very brief. I was simply to cut the cables as directed above, and under no circumstances to land. The orders were quite sufficient, and I was glad to escape being hampered by more explicit instructions. All should be nodding their heads here. Short clear orders. Now days, things won't be so dramatic. Submarines and drones can do it ... but the impact will be the same and more dramatic as it will impact everywhere from teenagers' bedrooms to The Pentagon. Silence. How the world would change in the blink of an eye. So, what is the backup plan? Head on over and read the whole thing by the guy who did the mission, LCDR Cameron Winslow, USN.